Susan Adele Greenfield, Baroness Greenfield, CBE, HonFRCP (born 1 October 1950) is a British scientist, writer, broadcaster, and member of the House of Lords. Her research has focused on the treatment of Parkinson’s disease and Alzheimer’s disease. She is also interested in the neuroscience of consciousness  and the impact of technology on the brain. Greenfield is Senior Research Fellow at Lincoln College, Oxford University  and was Professor of Synaptic Pharmacology. From 2005 to 2012, she was also Chancellor of Heriot-Watt University in Edinburgh between 2005 and 2013. From 1998 to 2010, she was director of the Royal Institution of Great Britain. In September 2013, she co-founded the biotech company Neuro-bio Ltd, where she is Chief Executive Officer. Susan Adele Greenfield was born to a Jewish father and a Christian mother in Hammersmith, London. Her mother, Doris (née Thorp), was a dancer, and her father, Reginald Myer Greenfield, was an electrician. She attended the Godolphin and Latymer School, where she took A levels in Latin, Greek and ancient history, and maths. The first member of her immediate family to go on to university, she was initially admitted to St Hilda’s College to read Philosophy, Psychology and Psychiatry, graduated with a first degree in experimental psychology. As a Senior Scholar at St Hugh’s College, Oxford, she completed her DPhil degree in 1977 under the supervision of Anthony David Smith on the Origins of acetylcholinesterase incerebrospinal fluid. She then held a junior research fellowship at Green College, Oxford between 1981 – 1984. Greenfield’s research is focused on brain physiology, particularly on the brain mechanisms of Parkinson’s and Alzheimer’s diseases, but she is also known as a populariser of science. Greenfield has written a range of books about the brain, regularly gives public lectures, and appears on radio and television. Since 1976, Greenfield has published some 200 papers in peer-reviewed journals, including studies on the basic brain mechanisms involved in addiction and reward,i.e. relating to dopamine systems and related neurochemicals. She investigated the brain mechanisms underlying ADHD as well as the impact of environmental enrichment. In 1994, she was invited to be the first woman to give the Royal Institution Christmas Lecture, then sponsored by the BBC. Her lecture was titled “Journey to the centre of the brain”. She was appointed Director of the Royal Institution in 1998,. The post was abolished in 2010. The Royal Institution had found itself in a financial crisis following a £22m development programme led by Greenfield and the Board. The project ended £3 million in debt. Greenfield subsequently announced that she would be taking her employers to an employment tribunal and her claim would include discrimination, but the case was settled out of court. Greenfield’s two main posts at Oxford were as Tutorial Fellow in Medicine at Lincoln College Oxford, and Professor of Synaptic Pharmacology. From 1995 to 1999, she gave public lectures as Gresham Professor of Physic in London. Greenfield was Adelaide‘s Thinker in Residence for 2004 and 2005. As a result of her recommendations, South Australian Premier Mike Rann made a major funding commitment, backed by the State and Federal Governments and the private sector, to establish the Royal Institution of Australia and the Australian Science Media Centre in Adelaide. She has explored the relevance of neuroscience knowledge to education and has introduced the concept of “mind change”, an umbrella term comparable to “climate change”, encompassing the diverse issues involved in the impact of the 21st-century environment on the brain. Baroness Greenfield sits in the Parliament of the United Kingdom in the House of Lords as a crossbencher, having no formal political affiliation. Records of Baroness Greenfield’s activity in the House of Lords indicate abstention on a range of issues. She has spoken on a variety of topics, including education, drugs, and economic empowerment for women. In 1995 Greenfield published her own theory of consciousness in Journey to the Centres of the Mind (1995), which was developed substantially in The Private Life of the Brain (2000). Her book The Human Brain: A Guided Tour (1997) was followed byTomorrow’s People (2003), which explored human nature and its potential vulnerability in an age of technology. These ideas were expanded in her later book, ID (2009). The theme of unprecedented changes to contemporary human cognition was briefly explored in a monograph You and Me (2011), and has was later developed further in an in-depth exploration of the impact of technology on the brain inMind Change published in 2014 by Random House. A further book A Day in the Life of the Brain is due to be published by Penguin in early 2016. In 2013 Greenfield published a dystopian science-fiction novel, 2121: A Tale from the Next Century, telling the story of videogame-playing hedonists and their conflict with “Neo-Puritans”. In press interviews, at public speaking events, as well as in her writing, Greenfield has expressed concerns that modern technology, and in particular social networking sites and video games, may have a significant impact on child development as a factor in autistic-like behaviour. She noted that Public Health England had related social networking and multiplayer online games to “lower levels of wellbeing”, and believed that evidence pointed to a “dose-response” relationship, “where each additional hour of viewing increases the likelihood of experiencing socio-emotional problems”. She believed this raised questions about where to draw the boundaries between beneficial and harmful use of such technology, saying that “it would be surprising if many hours per day of screen activity did not influence this neuroplasticity”. Greenfield has been criticised for explicitly linking the increase in internet usage to a rise in autism. In an 2015 article in the BMJ, clinical psychologist Vaughan Bell, developmental psychologist Dorothy Bishop and psychologist Andrew Przybylski took Greenfield to task for her statements, writing that Greenfield’s notion had “no basis in scientific evidence” and was “entirely implausible in light of what we know of autism as a neurodevelopmental condition”. They expressed concern that her work could be misleading to parents. Greenfield has 32 honorary degrees, and has received awards including the Royal Society‘s Michael Faraday Prize. She has been elected to an Honorary Fellowship of the Royal College of Physicians and the LondonScience Museum. In 2006 she was made an Honorary Fellow of the British Science Association and was the Honorary Australian of the Year. In January 2000, Greenfield received the CBE for her contribution to the public understanding of science. Later that year, she was named Woman of the Year by The Observer. In 2001, she became a Life Peer under the via the House of Lords Appointments Commission system, as Baroness Greenfield, of Ot Moor in the County of Oxfordshire. In 2003, she was appointed a Chevalier of the Légion d’Honneur by the French Government. In 2010 she was awarded the Australian Society for Medical Research Medal. She also received the British Inspiration award for Science and Technology in 2010. She is a patron of the Alzheimer’s Research UK and of Dignity in Dying. She is a founder and trustee of the charity Science for Humanity, a network of scientists, researchers and technologists that collaborates with non-profits to create practical solutions to the everyday problems of developing communities. Greenfield was married to University of Oxford Professor Peter Atkins from 1991 until their divorce in 2003. In the third video below in the 129th clip in this series are her words and my response is below them. I grew up at Bellevue Baptist Church under the leadership of our pastor Adrian Rogers and I read many books by the Evangelical Philosopher Francis Schaeffer and have had the opportunity to contact many of the evolutionists or humanistic academics that they have mentioned in their works. Many of these scholars have taken the time to respond back to me in the last 20 years and some of the names included are Ernest Mayr (1904-2005), George Wald (1906-1997), Carl Sagan (1934-1996), Robert Shapiro (1935-2011), Nicolaas Bloembergen (1920-), Brian Charlesworth (1945-), Francisco J. Ayala (1934-) Elliott Sober (1948-), Kevin Padian (1951-), Matt Cartmill (1943-) , Milton Fingerman (1928-), John J. Shea (1969-), , Michael A. Crawford (1938-), Paul Kurtz (1925-2012), Sol Gordon (1923-2008), Albert Ellis (1913-2007), Barbara Marie Tabler (1915-1996), Renate Vambery (1916-2005), Archie J. Bahm (1907-1996), Aron S “Gil” Martin ( 1910-1997), Matthew I. Spetter (1921-2012), H. J. Eysenck (1916-1997), Robert L. Erdmann (1929-2006), Mary Morain (1911-1999), Lloyd Morain (1917-2010), Warren Allen Smith (1921-), Bette Chambers (1930-), Gordon Stein (1941-1996) , Milton Friedman (1912-2006), John Hospers (1918-2011), Michael Martin (1932-), John R. Cole (1942-), Wolf Roder, Susan Blackmore (1951-), Christopher C. French (1956-) Walter R. Rowe, Thomas Gilovich (1954-), Paul Quincey, Harry Kroto (1939-), Marty E. Martin (1928-), Richard Rubenstein (1924-), James Terry McCollum (1936-), Edward O. WIlson (1929-), Lewis Wolpert (1929), Gerald Holton (1922-), Martin Rees (1942-), Alan Macfarlane (1941-), Roald Hoffmann (1937-), Herbert Kroemer (1928-), Thomas H. Jukes (1906-1999), Glenn Branch, Geoff Harcourt (1931-), and Ray T. Cragun (1976-). Let me respond first by saying that Dr. Greenfield’s assertion is that when the brain dies we die too, but is there evidence that there is a life after death as the Bible claims? WHAT IF THERE WAS EVIDENCE THAT THE BIBLE IS TRUE HISTORICALLY? IF THAT COULD BE SHOWN THEN WOULD DR. GREENFIELD BELIEVE WHAT IT SAYS ABOUT THE AFTERLIFE? 1. Even communication between once created person and another is not exhaustive, but that does not mean that for that reason it is not true. 2. If the uncreated Personal really cared for the created personal, it could not be thought unexpected for him to tell the created personal things of a propositional nature; otherwise as a finite being the created personal would have numerous things he could not know if he just began with himself as a limited, finite reference point. In such a case, there is no intrinsic reason why the uncreated Personal could communicate some vaguely true things, but could not communicate propositional truth concerning the world surrounding the created personal – for fun, let’s call that science. Or why he could not communicate propositional truth to the created personal concerning the sequence that followed the uncreated Personal making everything he made – let’s call that history. There is no reason we could think of why he could not tell these two types of propositional things truly. They would not be exhaustive; but could we think of any reason why they would not be true? The above is, of course, what the Bible claims for itself in regard to propositional revelation. DOES THE BIBLE ERR IN THE AREA OF SCIENCE AND HISTORY? The Bible is true from cover to cover and can be trusted. Charles Darwin himself longed for evidence to come forward from the area of Biblical Archaeology but so much has advanced since Darwin wrote these words in the 19th century! Here are some of the posts I have done in the past on the subject and if you like you could just google these subjects: 1. The Babylonian Chronicle, of Nebuchadnezzars Siege of Jerusalem, 2. Hezekiah’s Siloam Tunnel Inscription.13. The Pilate Inscription, 14. Caiaphas Ossuary, 14 B Pontius Pilate Part 2, 14c. Three greatest American Archaeologists moved to accept Bible’s accuracy through archaeology. I really enjoyed your TED TALK and I also got to hear another TED TALK the other day by Nobel Prize Winner John Polanyi whose father I am writing you about later in this letter. You might want to check that out on You Tube too. Baroness Greenfield sits in the Parliament of the United Kingdom in the House of Lords as a crossbencher, having no formal political affiliation. Records of Baroness Greenfield’s activity in the House of Lords indicate abstention on a range of issues. That intrigued me because I recently got involved in politics too and was elected Justice of the Peace in the 4th largest county in Arkansas and my wife Jill has served several years on the City Council in Shannon Hills. It has been many years since I first visited Parliament but I have been watching many of their sessions on television and reading about them. Recently I read about the amazing career of Dominick Geoffrey Edward Browne. I wonder if you ever got to know him and did you know that he was mentioned indirectly in what I think is the most famous Beatles song of all-time. What is the best Beatles song of all time? It is my opinion that is the song A DAY IN THE LIFE, and that is also the conclusion of Elvis Costello in his article “100 Greatest Beatles Songs,” September 19, 2011. Now they know how many holes it takes to fill the Albert Hall. The 4th Lord Oranmore and Browne, who has died aged 100, is believed to hold the record as the longest-serving member of the House of Lords, having taken his seat in 1927 and been evicted under the Government’s reforms of 1999. He earned the unspoken admiration of many by never speaking in the chamber, and was better known for his three marriages, particularly to the heiress Oonagh Guinness and to the actress Sally Gray. It was also his misfortune to be associated in the public memory with the tragic deaths in traffic accidents of first his parents in 1927, and then of his son Tara Browne, an icon of the Swinging Sixties, almost 40 years later. Dominick Geoffrey Edward Browne was born in Dublin on October 21 1901, heir to the Irish peerages of Oranmore and Browne of Carrabrowne Castle, Co Galway, and Castle Mac Garrett, Co Mayo. Oranmore and Browne married three times, first Mildred Helen, daughter of Thomas Egerton, a cousin of the Duke of Sutherland; they had two sons and three daughters (one of whom died aged 13). They divorced in 1936, so he could marry Oonagh Guinness, one of the “Golden Guinness girls”; she was a considerable heiress in her own right and the owner of Luggala, a fairytale Gothic lodge in the Wicklow mountains. Nobody was really sure if he was from the House of Lords. “A Day in the Life” is the final song on the Beatles‘ Sgt. Pepper’s Lonely Hearts Club Band album. Credited to Lennon–McCartney, the song comprises distinct sections written independently by John Lennonand Paul McCartney, with orchestral additions. While Lennon’s lyrics were inspired by contemporary newspaper articles, McCartney’s were reminiscent of his youth. The decisions to link sections of the song with orchestral glissandos and to end the song with a sustained piano chord were made only after the rest of the song had been recorded. The supposed drug reference in the line “I’d love to turn you on” resulted in the song initially being banned from broadcast by the BBC. Since its original album release, “A Day in the Life” has been released as aB-side, and also on variouscompilation albums. It has been covered by other artists, and since 2008, by McCartney in his live performances. It was ranked the 28th greatest song of all time by Rolling Stonemagazine. The magazine also ranked it as the greatest Beatles song. Guinness heir Tara Browne’s two children will be brought up by their 56-year-old grandmother, the High Court ruled yesterday. It turned down a plea by their mother, Mrs. Nicky Browne, 24, that she should have them …This, she said, happened after Mr. Browne, 21, from whom she was estranged, had taken them for a holiday in County Wicklow [Ireland] with his mother. Mrs. Browne began an action for their return in October , naming Mr. Browne and his mother as defendants. The action, held in private, was part way through when Mr. Browne died in a crash in his Lotus Elan car in South Kensington a week before Christmas. 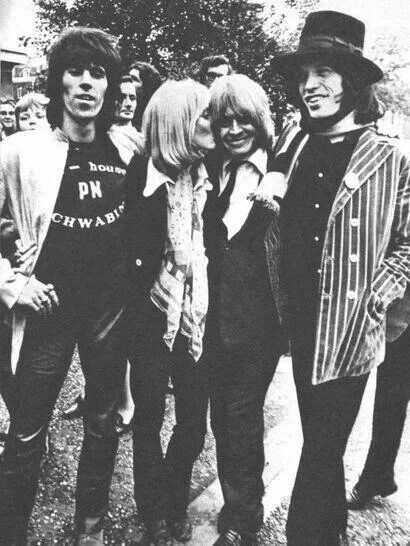 keith suki brian and mick. suki would later survive a car(Lotus Elan) crash driven by Tara Browne- heir to the Guinness fortune. The driver perished(blew his mind out in a car, he didn’t notice that the lights had changed) made famous by a Beatles song. WHAT IF THERE WAS EVIDENCE THAT THE BIBLE IS TRUE HISTORICALLY? IF THAT COULD BE SHOWN THEN WOULD YOU BELIEVE WHAT IT SAYS ABOUT THE AFTERLIFE? animate nature, being themselves irreducible to those laws. The pattern of organic bases in DNA which functions as a genetic code is a boundary condition irreducible to physics and chemistry. Further controlling principles of life may be represented as a hierarchy of boundary conditions extending, in the case of man, to consciousness and responsibility. I would like to send you a CD copy of this talk because I thought you may find it very interesting. It includes references to not only James D. Watson, and Francis Crick but also Maurice Wilkins, Erwin Schrodinger, J.S. Haldane (his son was the famous J.B.S. Haldane), Peter Medawar, and Barry Commoner. I WONDER IF YOU EVER HAD THE OPPORTUNITY TO RUN ACROSS THESE MEN OR ANY OF THEIR FORMER STUDENTS? Machines are not formed by physical and chemical equilibration. The functional terms needed for characterizing a machine cannot for defined in terms of physics and chemistry. Polanyi is talking about specific machines but I would include the great cause and effect machine of the external universe that functions on a cause and effect basis. So if this is true of the watch, then you have to ask the same question about the total machine that Sartre points out that is there, and that is the cause and effect universe. Polanyi doesn’t touch on this and he doesn’t have an answer, and I know people who know him. Yet nevertheless he sees the situation exactly as it is. And I would point out what Alfred North Whitehead (1861–1947) and J. Robert Oppenheimer (1904–1967) said and that it needed a Christian consensus to produce modern science because it was the Christian consensus that gave the concept that the world being created by a reasonable God and that it could be found out and discovered by reason. So the modern science when it began with Copernicus and Galileo and all these men conceived that the cause and effect system of the universe would be there on the basis that it was created by a reasonable God, and that is Einstein’s big dilemma and that is why he became a mystic at the end of life…What Polanyi says here can be extended to the watch, and the bridge and the automobile but also to the big cause and effect universe. You have to give some kind of answer to this too and I would say this to Michael Polanyi if I ever have a chance to talk to him. You need another explanation too Polanyi. 3. No physical chemical topography will tell us that we have a machine before us and what its functions are. In other words, if you only know the chemicals and the physics you don’t know if you have a machine. It may just be junk. So nobody in the world could tell if it was a machine from merely the “physical chemical-topography.” You have to look at the machineness of the machine to say it is a machine. You could take an automobile and smash it into a small piece of metal with a giant press and it would have the same properties of the automobile, but the automobile would have disappeared. The automobile-ness of the automobile is something else than the physical chemical-topography. 4. Such a topography can completely identify one particular specimen of a machine, but can tell us nothing about a class of machines. 5. And if we are asked how the same solid system can be subject to control by two independent principles, the answer is: The boundary conditions of the system are free of control by physics and can be controlled therefore by nonphysical, purely technical, principles. In other words you have to explain the engineering by something other than merely physical principles and of course it is. You can’t explain the watchness of the watch merely by this. You can explain it on the basis of engineering principles in which the human mind conceives of a use for the machine and produces the machine. But notice where Polanyi is and that is in our argument of a need of personality in the universe though Polanyi doesn’t draw this final conclusion, though I thought that is the only explanation. If you look at the watch a man has made it for the purpose of telling time. When you see the automobile a man has made it for the purpose of locomotion and the explanation of the difference is not in the chemical and physical properties but in the personality of a man to make these two different machines for two different purposes out of the same material. So what you are left here is the need of personality in the universe. Thank you for your time. I know how busy you are and I want to thank you for taking the time to read this letter.